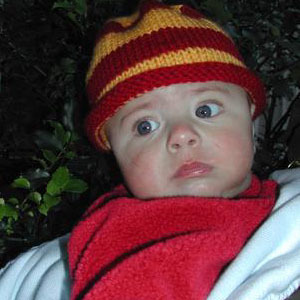 Long-time readers of La Gringa Tejedora may remember that I made Jason's brother-in-law a Redskins hat last Christmas. 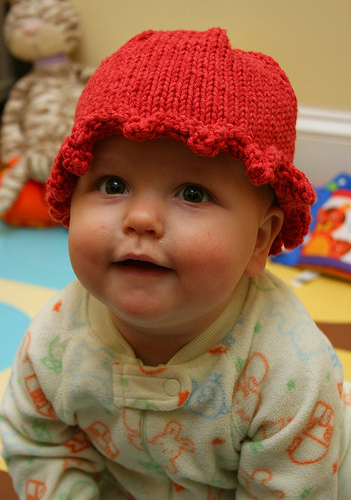 When I learned that his wife (Jason's sister) was preggers, I made a baby hat to match even though Henry was seven months from his arrival. In the frenzy of other things I've made him since then, I had almost forgotten about this little cap until Jason's mom sent us this picture! Hopefully, it's not the hat that's making him look so distressed! 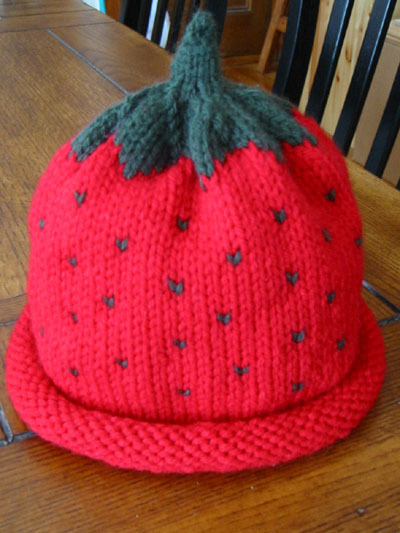 Since making a strawberry hat when I found myself without anything major on the needles worked so well last time, I did it again last week. This time, blueberry! I'll likely give this one to Jason's nephew Henry. When at the Yarn Barn in San Antonio last March, I broke down and bought the pattern for Ann Norling's berry caps. I didn't do anything with them right away, but I recently found myself without a major project so I decided to try one. I did most of it during the KnitSmiths yesterday, and finished it last night. Now I'm on to a blueberry! I posted about both of these hats when I finished them, but for obvious reasons I just had to post these pictures as well. I am told the the Christmas Tree Hat (on the right) was a big hit for the holidays. I credit the model. �a�a: No te vayas a la secci�n de "more" hasta que me visites en la Gran Manzana, si? No seas malita! Si? It's for the Cutest Baby Ever, of course. Pattern by Debby Ware, as featured in her book Too Cute!. This is a project that I finished ages ago -- I didn't take a picture of it before I sent it off so I never mentioned it here. I used this pattern*, and a pretty pink yarn. 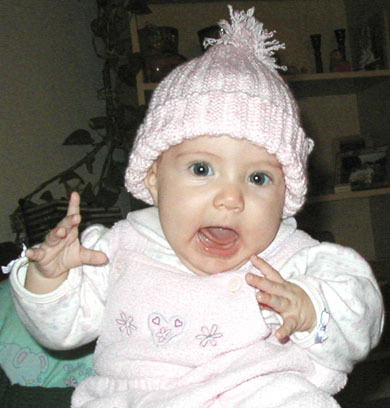 Most importantly, this is a picture of the oft-mentioned Bulis (a.k.a., the Cutest Baby Ever), who is making her first photographic appearance here in gringa-land. Being this far away from her for this long makes my heart hurt. *This link wasn't working tonight, so I went to the cached version, and copied the pattern into the "more" section of this post. Repeat rows 1-3 until piece measures 11 (14,16,18) inches slightly stretched. Whip stitch cast on and bind off edges together. Thread tail onto tapestry needle and gather top tightly and secure tail. Add a pom-pom or other topper to really make your hat unique! Cast on 56 stitches, and join. K all stitches, all rows. You will have 7 stitches remaining. Continue knitting until this "tail" is long enough to tie into the top-knot. Bind off, and weave in ends. 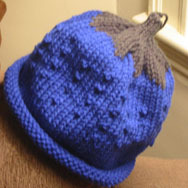 Today I finished my third baby hat using this easy, no-fuss pattern. I used #6 circular needles until it was time to decrease, and then I used double-pointed needles. I think this yarn is so dang kicky, and a bargain too! It's Red Heart Super Saver Multicolor, and the color is Mexicana. One of the hats is for my cousin Tiffanie's new baby (he'll have to grow into it!) and the other is for �a�a's Bulis, of course.